Believe it or not, it's been over 35 years since Castle Wolfenstein originally came out on the Apple II computer, and since then we've seen multiple reboots of the franchise including the famous Wolfenstein 3D in 1992, but in the modern age of first person shooters, there were doubts about where a game like this would fit into today's market. Luckily, Wolfenstein is back with the release of The New Order, introducing a multitude of new ideas to the table and executing them in a masterful manner that focuses on a single player campaign that might be one of the greatest World War II adventures to date. Taking place in an alternate reality of the 1960s where the Nazis won World War II and are now controlling the majority of the world, the story puts us the boots of the legendary William "B.J." Blazkowicz once again, following an incident introduced in the prologue where Blazkowicz takes a sharp glass piece to the skull. As a result, Will ends up in a mental asylum for 14 years, only to wake up at the sight of Nazis, moment when the story takes off with a revenge plot that feels believable even in the unlikely scenario of a world dominated by Nazis. The reason behind that is that the story is keeping the player engaged with a bunch of plot turns and a choice in the prologue that will influence the rest of the game, creating two different possible scenarios. Blazkowicz is no longer only a reckless killing machine, but for the first time in the series, he's given a personality, a reason, a background and even a love interest, all fundamental elements of the plot moving forward. Unlike other World War II focused-games where the action is focused around a historically accurate plot, Wolfenstein's fictional reality setting opens up the doors for a bunch of new opportunities such as the introduction of Nazi war machinery including giant death robots, laser guns and even robot guard dogs, all which somehow feel authentic because the world is created around them, rather than the other way around. Since the Nazis are now controlling the world, it is up to Blazkowicz and his team to sabotage their weapons and take down their bases, but that seems to be quite an impossible task for a group of people, and Wolfenstein: The New Order knows it, which is why missions aren't focused around killing sprees, but instead take a more logical approach of infiltrating highly guarded facilities and stealing their equipment while keeping a low profile, combining action packed moment with stealth sections and giving the player different options in order to approach a target differently. The problem that often comes up when rebooting an older FPS franchise is that with so many shooters on the market nowadays, it's out of the ordinary to make anything that won't be similar to Call of Duty, a sub-genre that a lot of people are getting tired of seeing, but MachineGames has done a wonderful job extracting the fun parts of a modern first person shooter and combining them with old school mechanics and features seen in the previous installments that together create a truly new experience. There's no one right way to play Wolfenstein: The New Order, as you can tryout for yourself different weapons, paths and skills in order to reach your objective, but a big difference from a vast majority of first person shooters is that in Wolfenstein experimenting with different approaches takes center stage, because new abilities are unlocked by completing perk objectives which require you to get a certain number of kills in a certain way. One great example of this mechanic is the Knife throwing perk objective which requires you to perform five stealth kills; upon completion the perk will unlock the ability to throw knives from a distance, opening up a whole new set of techniques and tactics. On top of that, The New Order is one of the best paced first person shooter campaigns I've ever played, as you will never do the same thing for too long and the desire to unlock all the perks will constantly push you to play out each scenario differently. The sight of a group of enemies gathered close will instantly resonate with you as an opportunity to get a few grenade kills, while hearing a commander alone in his office talking on the phone will open the room for a stealthy kill, but even so the game never forces you to do it this way, the choice is always yours. There are also numerous weapons that you can play around with, from shotguns to pistols, assault rifles and even dual wielding any of those, in addition to the laser cutter, giving you plenty of freedom in choosing your approach when playing on lower difficulty levels; play the game on UBER and you will end up using all of those as bullets will become more rare. Wolfenstein: The New Order is a pretty game, and even though the engine might be a little behind on what other games did back in 2014, it's the details put into every environments that make the game and the plot feel authentic, even though graphics are on a whole new level now than what they were back in 1992, The New Order has this one thing in common with Wolfenstein 3D, each location feels distinct and memorable, showing you the influence of Nazi technology and destruction in every place you visit, as one seemingly peaceful asylum will turn upside down once the Nazis show up, with broken furniture, blasted doors and shattered items everywhere. With a few minor visual glitches aside, the animation keeps up with the movement on the screen as characters will respond naturally to encounters and enemies will fall down differently depending on the way you choose to kill them. The obvious star of the show here is Blazkowicz himself, who finally has a modern face expression that helps with the more personal, intriguing story the game wants to tell this time around. The sound quality is top notch and even though there is no need to keep your headphones on for chat since there's no multiplayer, it certainly helps when playing on higher difficulties as enemy dialogue and bullet sounds can give you valuable information on the enemy's location without leaving your stealthy corner. Brian Bloom has done a great job voicing William Blazkowicz and the supporting cast of characters including Alicja Bachleda as Anya, Gideon Emery	as Fergus, Bonita Friedericy as Caroline and many more have a great chemistry that helps bring the whole world to life in a believable manner; even the enemy german voices are surprisingly good. The soundtrack includes popular german songs combined with some of Bethesda's in-house soundtrack and the result is a game that not only looks and plays great, but sounds great too. 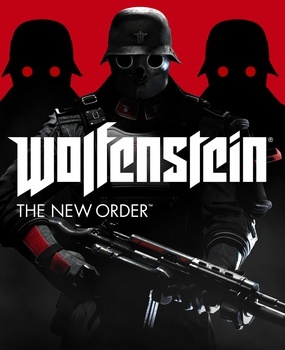 The lack of multiplayer might turn some heads away from this game, and if that's what you're looking for in game mostly, that's probably a good decision, but for those who are looking for a more story focused campaign with great shooting and mechanics, Wolfenstein: The New Order is an absolute must play, with more than 15 hours of singleplayer content to look forward to. The two different paths available add an extra reason to replay the campaign once more, on top of the numerous collectibles that you will need in order to unlock all achievements. Wolfenstein: The New Order is a breath of fresh air in the overpopulated market of first person shooters, mostly dominated by multiplayer games nowadays. There are enough new ideas, content and a story worth following to justify the purchase even without multiplayer, and solving all the enigma codes will unlock even more features and modes for players looking to master this game.